Ruins of Medieval Vainakh settlement. The so-called Vainakh tower architecture (Chechen: Вайнехан бӀаьвнийн архитектура, Russian: Вайнахская башенная архитектура) is a characteristic feature of medieval architecture of Chechenya and Ingushetia, north-eastern Georgia (aka Georgian Mountains area) as well conceptually similar Svan towers. Some towers were used as dwellings, others had a military purpose; some combined both functions. Typical Vainakh towers were built on a square base, ranging from 6 to 12 m wide and 10 to 25 m high, depending on the function. The walls were built of stone blocks, possibly with lime, clay-lime, or lime-sand mortar. The walls were inclined inwards and their thickness decreased on higher floors. The towers were built on hard rock. Vainakh towers used to be sparingly decorated with religious or good-wishing petrographs, such as solar signs or depictions of the author’s hands, animals, etc.. Defensive towers often bore a Golgopha cross. The construction of a tower, whether residential or military, was accompanied by rituals. Songs and folk tales emphasise the role of the "master builder", who, according to tradition, would direct a group of assistants who did the actual work. Some of these masters had their names preserved—such as Diskhi, associated in the local tradition to the military tower of Vougi. Some Chechen villages, such as Bavloi, specialized in tower building. Legends ascribe to the master builder the honourable and extremely dangerous task of erecting the tsIurku stone that topped the step pyramidal roof of a military tower. A ladder was tied to a machicolation on the outside for the master to reach the roof. It cost many masters their life. In case of success, the client gave the master a bull. The construction of a family tower cost the household 50 to 60 cows. Ivan Shcheblykin claimed that the tower builders did not need any scaffolding, and many researchers make that assumption. However, he may have meant that they used no scaffolding on the outside. Cornerstones were included in the design, to join the walls together and to support the higher floors. Interior scaffolds used in erecting the walls probably rested on those cornerstones, in which corbels were made for the purpose. Stones and beams were lifted with a windlass known as chIagIarg or zerazak. Large stones—some weighing several tonnes—were brought to the site by oxdriven sleds. The builders used many stonedressing tools—the berg (pick), the varzap (a large hammer), the jau (a small hammer), the daam (chisel), etc. Mortar was made on the site. Sand or clay was admixed to it in localities where lime was expensive. One of the master builder's most critical tasks was to estimate the proper amount of mortar to ensure the seismic resistance of the tower. Joints between stones were filled in with limewash for rain not to damage mortar. Ruins of Nikaroi settlement. A residential tower in foreground of the image. Residential towers were family dwellings, which have been compared to structures seen in prehistoric mountain settlements dating back to 8000 BC. The classic residential tower is a massive building, two to four stories high, with tapering walls and a flat shale roof. The floorplan is usually rectangular, measuring 8–10 by 8–12 meters. The tower tapered due to the walls getting thinner to the top, and due to their inward inclination. The thickness of the walls varies in different structures from 1.2–0.9 m at the bottom to 0.7–0.5 m at the top. The walls were made of stones of varying sizes (blocks or slabs, depending on the local stone), carefully dressed on the outside, with lime or clay-lime mortar and chip stone. Dry masonry was seldom used. Large stone blocks, sometimes weighing several tons, were used in the foundation and the ground-floor walls. 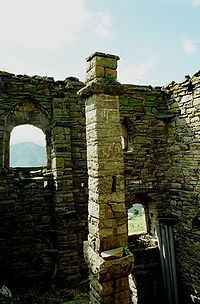 The towers had a central pillar, also of thoroughly dressed stone blocks, which supported the ceiling rafters. Purlines rested on pilasters or cornerstones, and common rafters, in their turn, rested on the purlines. The upper floors consisted of wood sticks resting on the rafters, coated with punned clay. The ground floor was paved with boards or stone slabs. Besides its structural function, the central pillar (erd-bogIam) had symbolic and religious significance in Vainakh culture, since ancient times. The two lower stories of a residential tower were intended for livestock. Cattle and horses were usually sheltered in the ground floor, part of which was fenced off for grain storage. Some towers had pits on the ground floor for that purpose, with stone-lined walls and bottom. In towers with four stories, the first floor above ground was typically used to shelter sheep and goats. It had a separate entrance, reached by a log ramp. The family lived in the second floor above ground (or in the first, in three-story towers). The family possessions—carpets, dishes, kitchen utensils, clothes, etc.—were kept there, in tin-lined wooden chests or on wooden shelves along the walls. The older towers had no wardrobes; instead, clothes were hung on metal hooks. Other towers had niches on the walls for that purpose. There was usually an arrangement of weaponry on the wall above the master bed. It was a dire necessity in wartime, and mere tradition in peace. 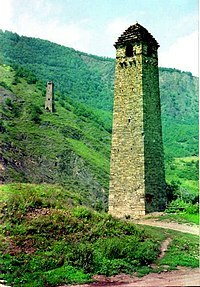 A majority of the military ("combat") towers in the Chechen mountains functioned both as watchtowers and as signalling beacons. Some served as fortified guard posts, or as safe shelters for one or two families, which lived in nearby residential towers, against raids. In some places, such as at Mount Bekhaila, several towers were enclosed in a common wall to create a small fortress. Construction of military towers began in the 10th and 11th centuries, and peaked between the 14th and the 17th centuries. Chechen and Ingush military towers are fairly similar, differing only in size and the construction time. Depending on their age, they differ also in the sophistication of construction techniques and stone dressing, and in the grace of form. Combat towers were generally taller but narrower than residential ones: 20–25 meters high or more, with four of five floors and a square base 5–6 meters wide. They were built of dressed stone with lime or lime-sand mortar. They had blank walls, cut only by embrasures and observation slits, on the most vulnerable side. There were no wooden parts on the tower exterior lest besiegers put them on fire. Doors and windows were on the side hardest of access. In some cases it is hard to believe that the defenders themselves could enter the tower. The entrance door was on the second floor, accessed through a ladder. The defenders fired at the enemy through loopholes and the top of the tower had machicolations–overhanging small balconies without a floor. Defensive towers were usually crowned with pyramid-shaped roofing built in steps and topping with a sharpened capstone. Beacon towers were erected on the top of cliffs to make them hard of access. The shape, size and site of a beacon was chosen so as to guarantee visual connection with the nearest beacons. Watchtowers were often built in strategic locations to control key bridges, roads and mountain passes. They were built near to a river, brook or spring, so that water could be brought into the tower through a concealed water duct. The ground floor ceiling of the later, 15th–17th century towers was a false vault, known as nartol tkhov, with two intercrossing rows of reinforcing ribs. Special attention was paid to the dressing and finishing of the keystones at the top of doors and windows, called kurtulg ("proud stone"). They bore the name of the owner, and were frequently decorated with petroglyphs. Researchers differ in the functions of the various floors. Some assume that the ground floor was used for livestock, while others say it was a prison for captives. Actually it seems that the ground floor was filled in with stone and earth to reinforce the tower bottom against ramming. 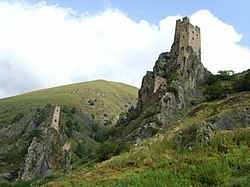 Chechen legends connected to certain towers claim that ancient heroes lived in them. These legends are probably wrong, since the interior of such towers is not adequate for prolonged dwelling. The classical combat tower was not intended to withstand long sieges. Tower defenders had only a small stock of food and extremely limited arsenals, be it arrows, stone missiles or powder and shot in later times. Due to their small size, a watchtower or a beacon could house four to six on outsentry duty. All combat tower stories were equipped for observation and fighting. 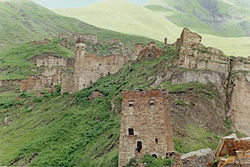 In the 13th–14th centuries, increased danger of aggression in certain parts of the Chechen mountains let to the reinforcement of residential towers. The result were buildings that combined the functions of residential and defensive towers; they were smaller in size than the former, but a bit wider than the latter. Like the military towers, they had loopholes and machicolations (mâchicoulis). One typical tower had five stories, and three doors in the façade—one on each of the first three floors. It has machicolations for archers on the top floor. The tower's ground-level floorplan measures 8.0 х 9.0 m, and the building is 11 metres tall. The ground floor wall is 75 centimetres thick. 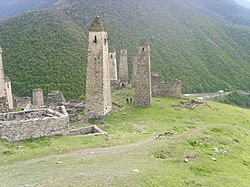 These mixed-function towers are rare in the Chechen highland, probably because tower complexes and castles had become widespread by the time this concept appeared. Whereas a tower had space for only a few cows and horses, a castle could shelter to the entire livestock in wartime. ^ a b c d Lecha Ilyasov. The Diversity of the Chechen Culture: From Historical Roots to the Present. ISBN 9785904549022. ^ Щеблыкин И. П. Искусство ингушей в памятниках материальной культуры // Известия Ингушского научно-исследовательского института истории и культуры. Владикавказ, 1928. Вып. 1. Page 282. ^ Марковин В.И. Памятники зодчества в горной Чечне. (по материалам исследований 1957–1965 гг.) // Северный Кавказ в древности и средние века. М., 1980. С.184–270.